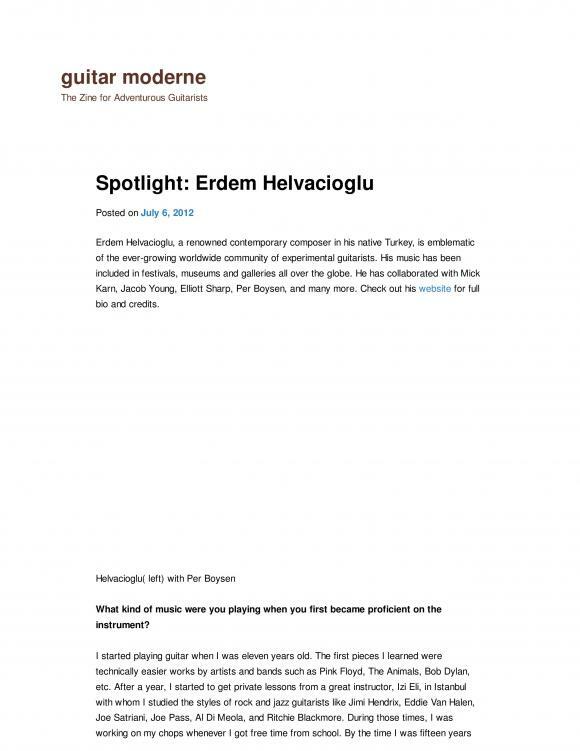 Erdem Helvacioglu, a renowned contemporary composer in his native Turkey, is emblematic of the ever-growing worldwide community of experimental guitarists. His music has been included in festivals, museums and galleries all over the globe. 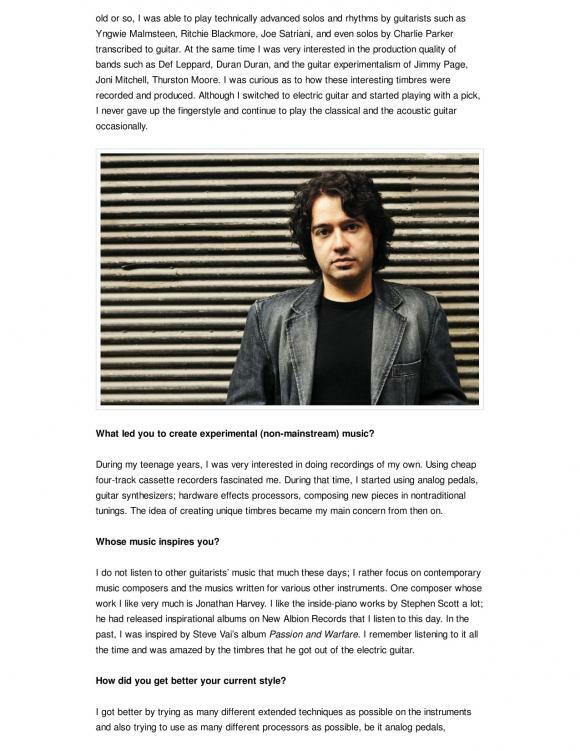 He has collaborated with Mick Karn, Jacob Young, Elliott Sharp, Per Boysen, and many more. Check out his website for full bio and credits. I started playing guitar when I was eleven years old. The first pieces I learned were technically easier works by artists and bands such as Pink Floyd, The Animals, Bob Dylan, etc. After a year, I started to get private lessons from a great instructor, Izi Eli, in Istanbul with whom I studied the styles of rock and jazz guitarists like Jimi Hendrix, Eddie Van Halen, Joe Satriani, Joe Pass, Al Di Meola, and Ritchie Blackmore. During those times, I was working on my chops whenever I got free time from school. By the time I was fifteen years old or so, I was able to play technically advanced solos and rhythms by guitarists such as Yngwie Malmsteen, Ritchie Blackmore, Joe Satriani, and even solos by Charlie Parker transcribed to guitar. At the same time I was very interested in the production quality of bands such as Def Leppard, Duran Duran, and the guitar experimentalism of Jimmy Page, Joni Mitchell, Thurston Moore. I was curious as to how these interesting timbres were recorded and produced. Although I switched to electric guitar and started playing with a pick, I never gave up the fingerstyle and continue to play the classical and the acoustic guitar occasionally. What led you to create experimental (non-mainstream) music? During my teenage years, I was very interested in doing recordings of my own. Using cheap four-track cassette recorders fascinated me. 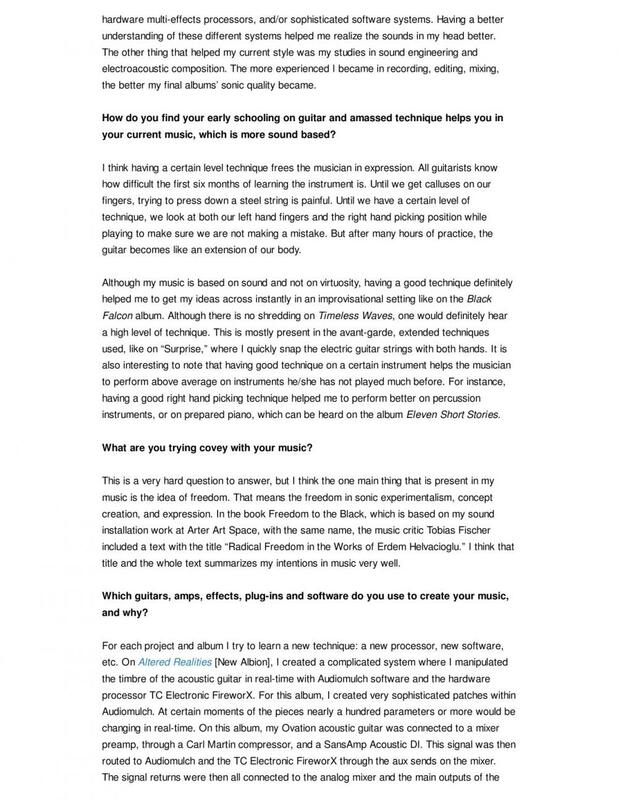 During that time, I started using analog pedals, guitar synthesizers; hardware effects processors, composing new pieces in nontraditional tunings. The idea of creating unique timbres became my main concern from then on. I do not listen to other guitarists’ music that much these days; I rather focus on contemporary music composers and the musics written for various other instruments. One composer whose work I like very much is Jonathan Harvey. I like the inside-piano works by Stephen Scott a lot; he had released inspirational albums on New Albion Records that I listen to this day. In the past, I was inspired by Steve Vai’s album Passion and Warfare. I remember listening to it all the time and was amazed by the timbres that he got out of the electric guitar. How did you get better your current style? I got better by trying as many different extended techniques as possible on the instruments and also trying to use as many different processors as possible, be it analog pedals, hardware multi-effects processors, and/or sophisticated software systems. Having a better understanding of these different systems helped me realize the sounds in my head better. The other thing that helped my current style was my studies in sound engineering and electroacoustic composition. The more experienced I became in recording, editing, mixing, the better my final albums’ sonic quality became. How do you find your early schooling on guitar and amassed technique helps you in your current music, which is more sound based? I think having a certain level technique frees the musician in expression. All guitarists know how difficult the first six months of learning the instrument is. Until we get calluses on our fingers, trying to press down a steel string is painful. Until we have a certain level of technique, we look at both our left hand fingers and the right hand picking position while playing to make sure we are not making a mistake. But after many hours of practice, the guitar becomes like an extension of our body. 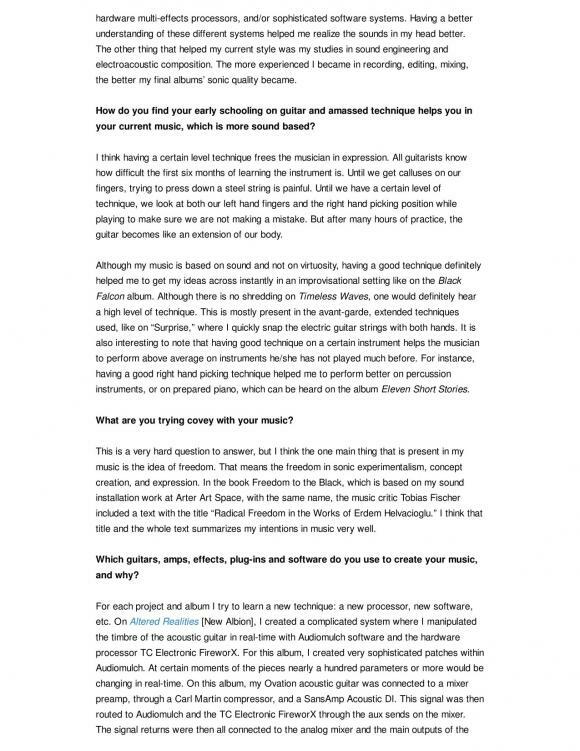 Although my music is based on sound and not on virtuosity, having a good technique definitely helped me to get my ideas across instantly in an improvisational setting like on the Black Falcon album. Although there is no shredding on Timeless Waves, one would definitely hear a high level of technique. This is mostly present in the avant-garde, extended techniques used, like on “Surprise,” where I quickly snap the electric guitar strings with both hands. It is also interesting to note that having good technique on a certain instrument helps the musician to perform above average on instruments he/she has not played much before. For instance, having a good right hand picking technique helped me to perform better on percussion instruments, or on prepared piano, which can be heard on the album Eleven Short Stories. What are you trying covey with your music? This is a very hard question to answer, but I think the one main thing that is present in my music is the idea of freedom. That means the freedom in sonic experimentalism, concept creation, and expression. 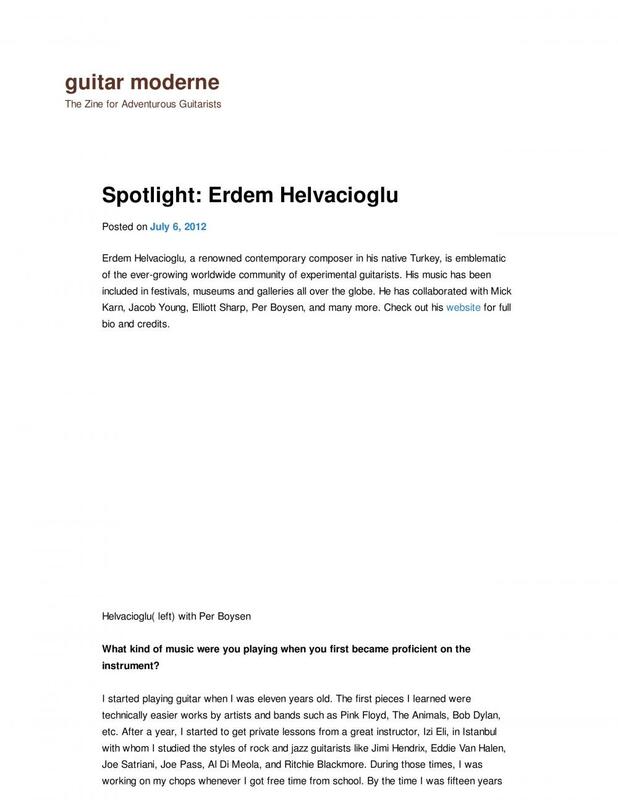 In the book Freedom to the Black, which is based on my sound installation work at Arter Art Space, with the same name, the music critic Tobias Fischer included a text with the title “Radical Freedom in the Works of Erdem Helvacioglu.” I think that title and the whole text summarizes my intentions in music very well. Which guitars, amps, effects, plug-ins and software do you use to create your music, and why? For each project and album I try to learn a new technique: a new processor, new software, etc. On Altered Realities [New Albion], I created a complicated system where I manipulated the timbre of the acoustic guitar in real-time with Audiomulch software and the hardware processor TC Electronic FireworX. For this album, I created very sophisticated patches within Audiomulch. At certain moments of the pieces nearly a hundred parameters or more would be changing in real-time. On this album, my Ovation acoustic guitar was connected to a mixer preamp, through a Carl Martin compressor, and a SansAmp Acoustic DI. This signal was then routed to Audiomulch and the TC Electronic FireworX through the aux sends on the mixer. The signal returns were then all connected to the analog mixer and the main outputs of the mixer were connected to the Tascam DA-20 DA Recorder. Whereas on Black Falcon, I did not use a software system at all; I created a hardware system with the TC Electronic FireworX, Lexicon MPX100, and Electro-Harmonix Stereo Memory Man. The electric guitar signal was connected to a Marshall JMP1 preamp after many analog pedals. The speaker simulator output of the preamp was connected to an analog mixer and this signal was routed to the processors listed above through the aux sends. This system let me to route the effects returns to each other to create interesting feedback-like sonic characteristics. 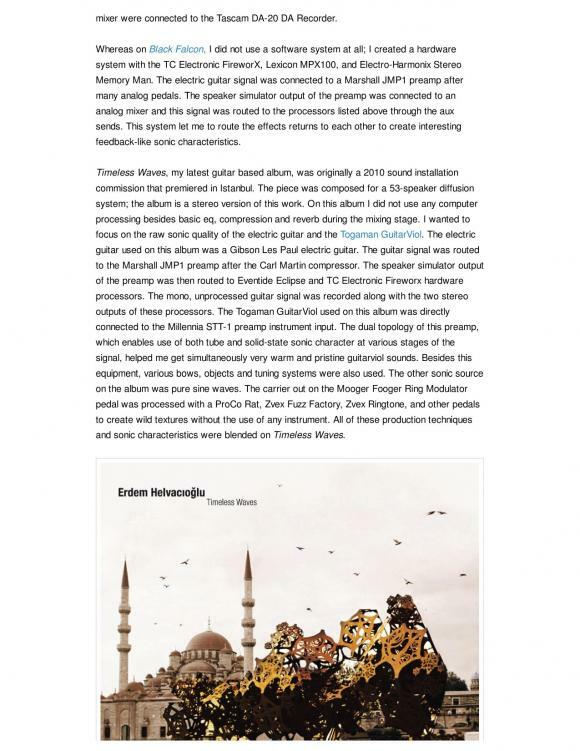 Timeless Waves, my latest guitar based album, was originally a 2010 sound installation commission that premiered in Istanbul. The piece was composed for a 53-speaker diffusion system; the album is a stereo version of this work. On this album I did not use any computer processing besides basic eq, compression and reverb during the mixing stage. I wanted to focus on the raw sonic quality of the electric guitar and the Togaman GuitarViol. The electric guitar used on this album was a Gibson Les Paul electric guitar. The guitar signal was routed to the Marshall JMP1 preamp after the Carl Martin compressor. The speaker simulator output of the preamp was then routed to Eventide Eclipse and TC Electronic Fireworx hardware processors. The mono, unprocessed guitar signal was recorded along with the two stereo outputs of these processors. The Togaman GuitarViol used on this album was directly connected to the Millennia STT-1 preamp instrument input. The dual topology of this preamp, which enables use of both tube and solid-state sonic character at various stages of the signal, helped me get simultaneously very warm and pristine guitarviol sounds. Besides this equipment, various bows, objects and tuning systems were also used. The other sonic source on the album was pure sine waves. The carrier out on the Mooger Fooger Ring Modulator pedal was processed with a ProCo Rat, Zvex Fuzz Factory, Zvex Ringtone, and other pedals to create wild textures without the use of any instrument. All of these production techniques and sonic characteristics were blended on Timeless Waves. 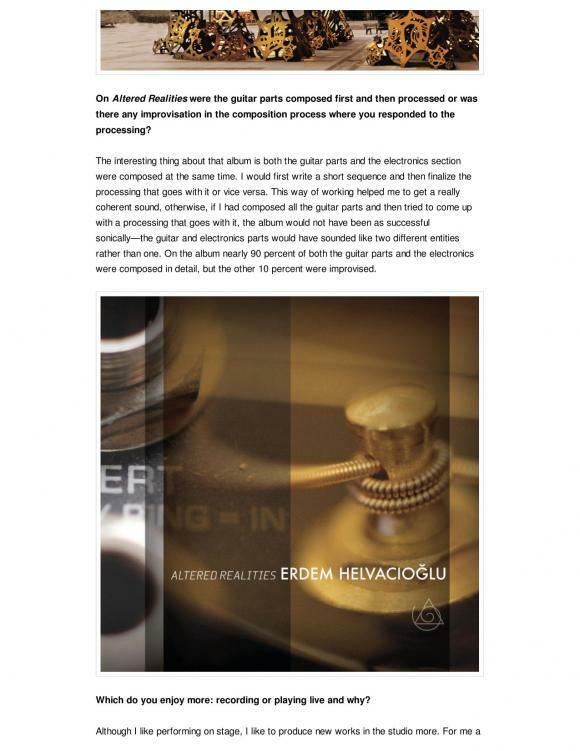 On Altered Realities were the guitar parts composed first and then processed or was there any improvisation in the composition process where you responded to the processing? The interesting thing about that album is both the guitar parts and the electronics section were composed at the same time. I would first write a short sequence and then finalize the processing that goes with it or vice versa. This way of working helped me to get a really coherent sound, otherwise, if I had composed all the guitar parts and then tried to come up with a processing that goes with it, the album would not have been as successful sonically—the guitar and electronics parts would have sounded like two different entities rather than one. On the album nearly 90 percent of both the guitar parts and the electronics were composed in detail, but the other 10 percent were improvised. Although I like performing on stage, I like to produce new works in the studio more. For me a studio is a sonic canvas and I see myself more of a painter or a sculptor who uses sound as his main material in a way an artist would use paint, colors or shapes. I think this perspective liberates me a lot in the studio and I seem to enjoy this freedom more than the more rigid and predetermined character of performing on stage. By releasing as much high quality material as possible. Besides releasing my own material and performing at concerts, I also receive commissions from ensembles such as Bang on a Can All-Stars, or festivals such as the Novelum Festival in France. The premiers of these commissioned works and their performances also help to build up an audience that is interested in my work. With whom would you like to collaborate and why? The first guitarist with whom I would like to collaborate would be David Torn. Although I have listened to interesting guitar based albums before hearing his work, he is the first player who made me the rethink the role of the guitar. The guitar on his work is not just another instrument but a sonic machine that creates unique textures. He is the one responsible for my initial interest in texture-based music. I think a duo record where we combine his equipment, with my hardware and software systems would be pretty wild! 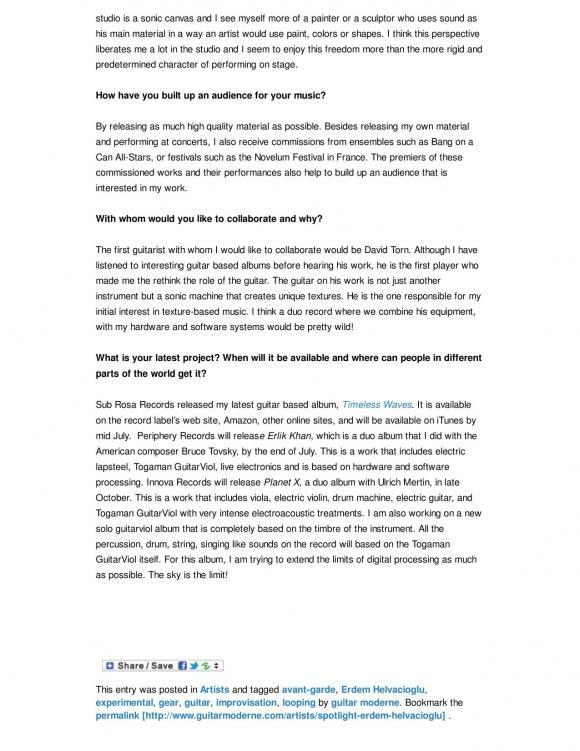 Sub Rosa Records released my latest guitar based album, Timeless Waves. It is available on the record label’s web site, Amazon, other online sites, and will be available on iTunes by mid July. Periphery Records will release Erlik Khan, which is a duo album that I did with the American composer Bruce Tovsky, by the end of July. This is a work that includes electric lapsteel, Togaman GuitarViol, live electronics and is based on hardware and software processing. Innova Records will release Planet X, a duo album with Ulrich Mertin, in late October. This is a work that includes viola, electric violin, drum machine, electric guitar, and Togaman GuitarViol with very intense electroacoustic treatments. I am also working on a new solo guitarviol album that is completely based on the timbre of the instrument. All the percussion, drum, string, singing like sounds on the record will based on the Togaman GuitarViol itself. For this album, I am trying to extend the limits of digital processing as much as possible. The sky is the limit!